Have you ever made a yellow cake recipe and been disappointed to find it was actually more of an off-white? Or worse, have you ever made an off-white yellow cake that tasted okay, but had the texture of cornbread? If either of these situations sounds familiar, then here’s a new recipe you should try. It’s a soft, non-crumbly scratch yellow cake with a vibrant yellow color and a flavor that’s a little more interesting than vanilla. The mixing method used is called “The Two Stage Method“, where you mix the dry ingredients and add the liquid in stages. The cake appears to be fairly simple, but making a simple yellow cake recipe requires attention to detail as you bake, so here are a few tips. 1. You should definitely us cake flour for best results. Cake flour weighs about 4 oz per cup and all-purpose flour weighs about 5, so if you use 3 cups of all-purpose flour you’ll be using closer to 15 oz of flour than 12. 2. McCormick Vanilla Butter & Nut extract is my new favorite yellow cake ingredient. Along with an interesting flavor that seems perfect for yellow cake, it has a bit of yellow food color mixed in. 3. And finally, egg yolks add a bit of color, but more importantly they add a softer texture. Please don’t be tempted to substitute whole eggs. UPDATE: This cake is great with the special extract, but don’t skip it just because you can’t find it because regular vanilla is fine. Also, this recipe halves well, so you can make a small layer cake using 6 inch round pans if you prefer. 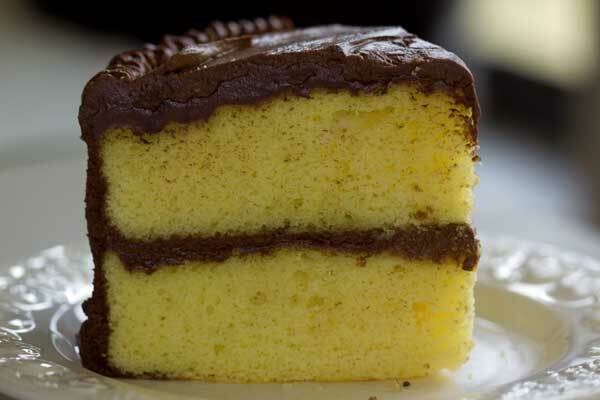 A classic American style yellow cake recipe with chocolate frosting. This recipe uses the two-stage method in which dry ingredients are mixed with part of the liquid and the remaining liquid is added in stages. Preheat the oven to 350° F. Grease and flour two 9 inch round pans. Side should be at least 2 inches high. Whisk the eggs, yolks, extracts and 1/4 cup of the milk in a bowl. In a stand mixer bowl with the paddle attached, combine the flour, sugar, baking powder and salt. Stir until thoroughly mixed. Add softened butter (and shortening if you are using half and half) to the flour mixture and stir with a spoon or mash with a scraper until butter coats flour. Add the remaining 1 cup of milk to the flour mixture and stir until thick and pasty. With the mixer, beat on medium for about two minutes. Gradually add the egg mixture, scraping down sides of the bowl. Beat on medium for about 30 seconds. Pour the batter into the pans and bake for about 30 minutes or until cakes spring back when touched. Let cool for 10 minutes in pan, then invert and let cool completely. To make the chocolate frosting, mix the softened butter, salt and powdered sugar together in a bowl. Stir in the cocoa powder, sour cream and cream and beat until well mixed. Add vanilla, then continue beating with an electric mixer and adding milk as needed until icing is thick and creamy. Add more sugar if it's not sweet enough for you. This cake halves perfectly. Halve all the ingredients and use 6 inch round pans. Also, for the frosting you can use a different ratio of cream if you prefer or even use whole milk in place of cream. The cream adds richness, but whole milk is still very good. Heidi, thanks so much for taking the time to leave a review. Can’t wait to see your photos! I made this yellow cake today. I didn’t use your icing recipe though – I made a simple chocolate icing made with butter, shortening, cocoa, whole milk, vanilla and a bit of salt. As for the cake, I didn’t have that particular extract you called for so I used vanilla extract and butter extract. I made 1.5 recipes because I wanted to make a 9 inch triple layer cake. 1.5 recipes made the perfect amount of batter for that. The cake is delicious and I especially like that it has a very fine velvety crumb. I sifted my cake flour (with the baking powder & salt) before I added the butter. I think the sifting helped make the fine crumb. Oh, and I used half butter and half shortening like you suggested. This is probably the best from scratch yellow cake I’ve made before. I’ve made many that have a much coarser crumb – which I don’t like. I will try and post my results on my blog soon. I took some pics but haven’t made an effort to download them yet. My blog is VERY out of date. I bake constantly but just never make the effort to post the results! I don’t know how you find the time to keep yours so updated. I’m always checking your blog to read about your latest creations! A classic favorite can’t be beat! This looks really good! Kim, yellow cake can be boring, but this one is not — especially with the frosting. I should add that I use natural as opposed to Dutch for this one. Karen, you’ve given me an idea. I might try to make this one as a marble cake. Gosh, yellow cake and chocolate frosting!!!! This used to be my very favorite cake/frosting combination! I have not had it so many years, I kind of forgot all about it. Might just have to make this… cupcakes would be perfect! Hi Anna, thanks for posting this Yellow Cake, looks like a keeper to me. I’ll try to find the McCormick Vanilla Butter and Nut Extract in our groceries, I hope they have it. The Chocolate Frosting is my husband’s favorite! Do you think, the cake recipe will also be good to make into cupcakes? Thanks.